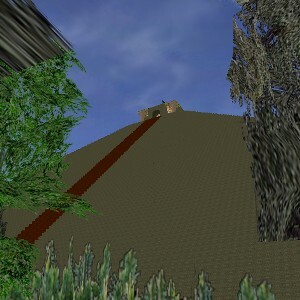 The Sun Temple is an ancient pyramid located in the K'iin Woods in the Syntax Estates precinct. The temple stands fifty-seven meters tall and contains various other ancient structures around the base of it, such as a small sacrificial pyramid. Scientists say the temple was originally built within a desert climate, but it has long since been filled in from nearby forest and brush. Much evidence supports this idea, such as the prominance of sandstone bricks in the structure itself and various sand deposits near the site but it is still yet to be proved. Some even claim that it was once part of the Faldon Desert but due to drastic climate shifts, the desert subsided and now only claims the portion of land that you see today. No scientific evidence supports this claim. The temple itself contains a two burial chambers; one sub-tomb and a master tomb, along with a small maze which was probably built to try and confuse or trap anyone who attempted to break in and rob the tombs. Overall, the internal structure is fairly simplistic and can most likely be attributed to the construction skills of the builders at the time.